In 2018, Melony Heyn Lifetime Service Award was established to honor a former board member who passed away in 2015. Melony spent many years and hours dedicated to serving on the board of Greater Ohio Area SuperKids. She was member and Past National President of Delta Theta Tau Sorority, and also a board member for the National Super Kids Classic. Many volunteers, racers and families credit Melony for introducing them to this amazing event, and she was our original connection with many of our sponsors who return year after year, as well as our connection with many of our long-time sponsors and donor. We will always remember her love for our special racers and the sound of “Hey Kiddo” echoing through Derby Downs. 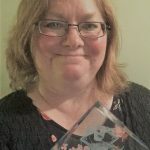 Melony held a special place in the history of Greater Ohio Area SuperKids, and in memory of her – this award was created to allow us to occasionally recognize volunteers who have dedicated far above and beyond what we would expect from a volunteer. In 2018, the first Melony Heyn Lifetime Service Award was presented to Cindee Case. Cindee served on the GOASKCI board for 10 years in multiple roles –Vice President, volunteer coordinator, bylaws coordinator, publicity manager, parade manager, all the while living nearly an hour away and traveling extensively for work. Two years after rotating off the Board of Directors, she continued manage publicity, and parade events, and still manages the organizations Facebook page – setting up posts throughout the year to continue recognizing sponsors and sharing updates on race events.